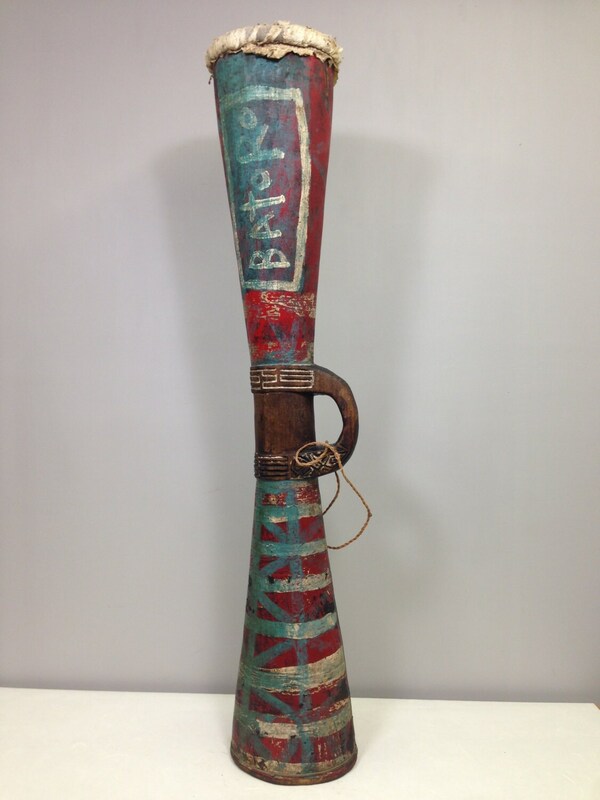 This is a fabulous old Tall Painted Red and Green Drum from the Asmat Tribe of Papua. The Asmat are a tribal group who inhabit parts of Papua, Indonesia, in the area formerly known as the Irian Jaya province of the Merauke regency on the island of New Guinea. 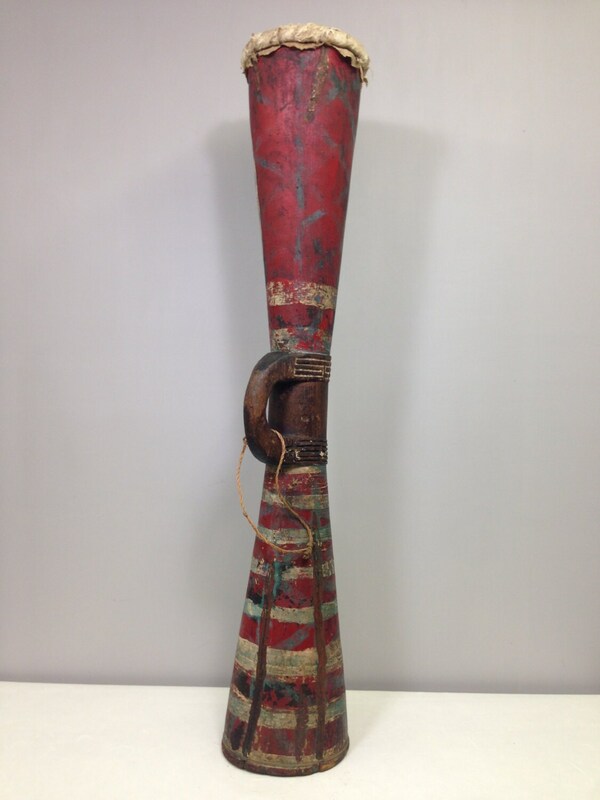 The Asmat are sometimes known as “tree” or “wood” people based on the origin myth in which their ancient god, Fumiripitj, carved a tree trunk into a long cylindrical drum and, when he played upon it, the drum came to life as a man. 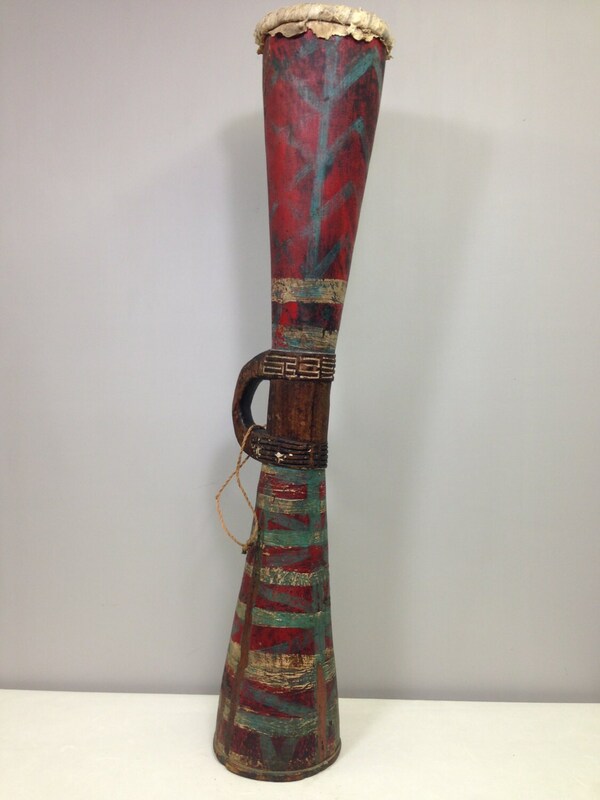 The tribe is known not only for its highly developed art of wood carving.This tribal drum is a detailed chanting drum that features many characteristics of the drums of the Asmat, including their use of only three colors black, red, and white and in this case the use of green as well. It is carved into an hourglass shape from a single piece of dark wood, probably found in an inland region of the island. A lizard-skin head is traditionally glued to the shell with a mixture blood and lime, and held in place with a band of braided plant fibers. It is initially tuned by being held over hot coals or flame. In this culture, carving is men’s art; work with fibers is women’s art. The has a simply carved handle depicts both man and bird shapes, all of which are decoratively wrapped with hanging twine. The drums are played in large groups of instruments, held by the handle in one hand and struck with the other, and are sometimes played while dancing in full-body costumes made of bark, fiber, and leaves of the sago tree. This drum is old and has Pig Skin that remains around the outside and the top portion of the drum. 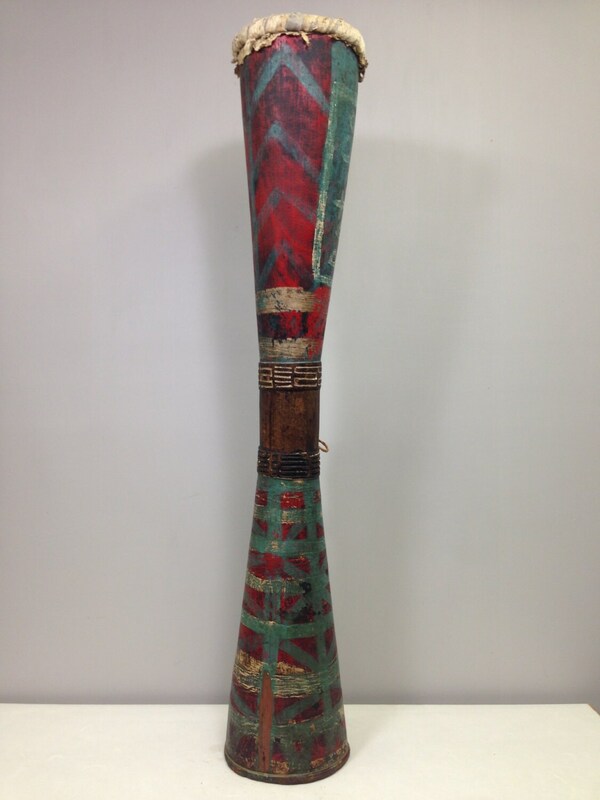 Today the Monitor lizard skins on the heads of drums are now on the endangered specie list.This is a magnificent old drum in color, design and style and would be a wonderful addition to your collection or to your home.